Something unusual happened at Senate Wednesday after Michael Di Grappa presented McGill’s vision for a revamped and repurposed Royal Victoria Hospital. Senators burst into spontaneous applause. “The important word you used is ‘vision,’ ” said a passionate Senator and Governor Emeritus Alex Kalil. “Without vision, this country wouldn’t be one of the best in the world! Without vision our universities wouldn’t be what they are today." Something unusual happened at Senate Wednesday after Michael Di Grappa presented McGill’s vision for a revamped and repurposed Royal Victoria Hospital. Senators burst into spontaneous applause. A number of individual senators spoke in praise of the plan. “The important word you used is ‘vision,’ ” said a passionate Senator and Governor Emeritus Alex Kalil. “Without vision, this country wouldn’t be one of the best in the world! Without vision our universities wouldn’t be what they are today. 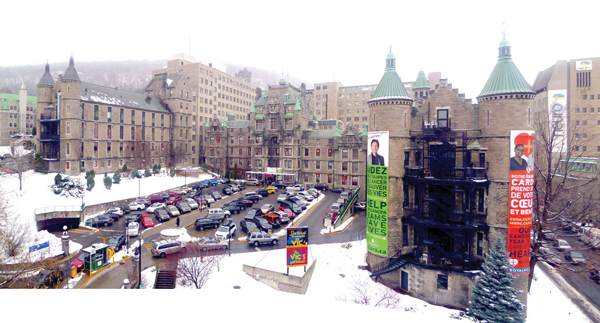 The big picture, as outlined in a McGill Reporter story earlier this spring, is to take the 120-year-old hospital campus and gut but preserve its numerous heritage buildings; knock down some more modern structures that have virtually no heritage value; build new, less-intrusive, cutting-edge teaching and research facilities; open up new pathways to the Mountain for all Montrealers to enjoy; and turn a number of parking lots into green space. The price tag at the moment? About $700 million, Di Grappa told Senate. “Whoever takes over the site will face a tremendous bill at the end of the day,” he said. “Everyone is curious to see how we will pay for it. “What we are proposing is a one-third/one-third/one-third financing plan shared by the government of Quebec, the federal government and McGill University. The City of Montreal would have to contribute as well,” Di Grappa said. Di Grappa’s Senate presentation is part of a chain of consultations and presentations both within the McGill community and without. Di Grappa and Vice-Principal (Communications and External Relations) Olivier Marcil made a similar pitch to Les amis de la montagne last month and so far others have been made to small groups in the Faculties of Law and Management. McGill has been working for the past year on a number of studies to figure out how the RVH might be utilized by the university, spending about $1 million in the process, Di Grappa told Senate. If all goes according to the proposed plans and timeline, one could conceivably see construction beginning as early as 2017 and continuing over the next four to five years. While the province, which owns the property, might be a motivated seller because it would cost Quebec $10-$12 million just to keep the buildings heated and secure, McGill will only proceed if certain conditions are met, Di Grappa said. The University would not seek to use the entire site, at least not in the initial stages. Partners would be sought to renovate the Ross and Women’s pavilions in the northeast quadrant of the RVH campus, Di Grappa said. Where, some Senators asked, would McGill’s share of the $700-million cost come from? Di Grappa spoke of a special philanthropic campaign and the sale of non-strategic buildings on the periphery of the downtown campus as significant sources of revenue for McGill’s contribution. “We do not want to add to our infrastructure deficit,” he said. Di Grappa told Senate he’s not sure what faculties or institutes or administrative units could be moved to the Vic site, as plans are still preliminary. The University is seeking government support to conduct more intensive studies over the next year. And the provincial government has recognized that McGill has a space deficit of approximately 700,000 square feet. One of the eye-catching slides in the Power Point presentation shows a massive glass dome covering a 2,000-seat convocation hall that could serve as an important location for important University and community events. It’s a vision of what could be, if the stars (and the dollars) align.